For this experiment, the sausage I am using is a spicy dry Salami as that was the best I could locate. Andouille Sausage is commonly used, and Chorizo would also work nicely, but whatever you use, make sure it is one of the drier, harder varieties as they will stand up to the cooking and retain their flavor. 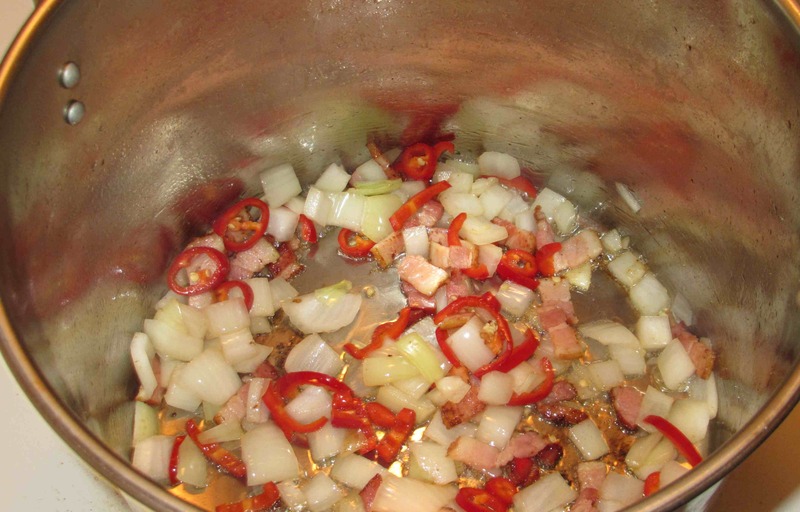 Heat a good, heavy pot over medium heat and add a good three or four tablespoons of olive oil. Sautee the bacon pieces until they render their fat and are jut beginning to get crispy and then add in the onion and chili pepper. 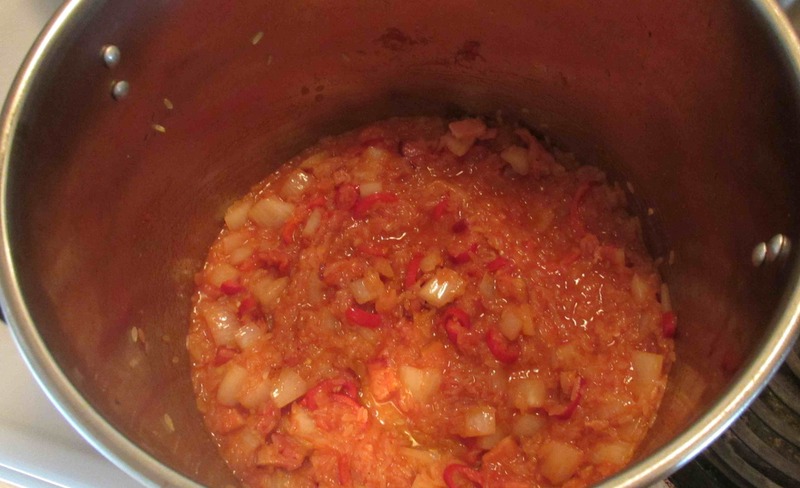 When the onion is soft and translucent, throw in the rice and the garlic salt and continue stirring until all the rice grains are coated in fat, then stir in the tomato paste and white wine. Continue stirring the dish until the rice absorbs a little of the wine and some color from the tomato paste and then throw in the shrimp, sausage, okra and red pepper. Add the chicken stock and then, when the liquid starts to boil, cover the pot and turn the heat to low. Allow everything to cook for about twenty minutes and then uncover the pot and stir well to make sure nothing is sticking to the bottom. Add the green pepper and the parsley, stir again and cover the pot once more. Let it cook for another ten minutes and then serve. If you like, and don’t mind a little non-traditional enhancement, pass some Parmesan cheese along with it at the table. On this occasion, I made a bit of a mistake accidentally added only two, rather than three, cups of chicken stock at the beginning. I noticed things looked a little dry when I first uncovered the pot and added some additional liquid along with the green pepper and parsley. Thankfully, it all turned out quite well. The okra was a first for me on this occasion and my wife and I both enjoyed the texture it gave the finished dish. The red chili pepper was also a bit of a change as I usually add just a pinch or two of pepper flakes. Jambalaya is not generally an exceptionally spicy dish but the heat that the fresh hot peppers added was very pleasant on this occasion. A few more shrimp would have been welcome (and next time I may add some squid), but, all in all, the result was very good. This looks amazing! I love jambalaya and I would love a giant pot full of this right now. It just seems like great comfort food! 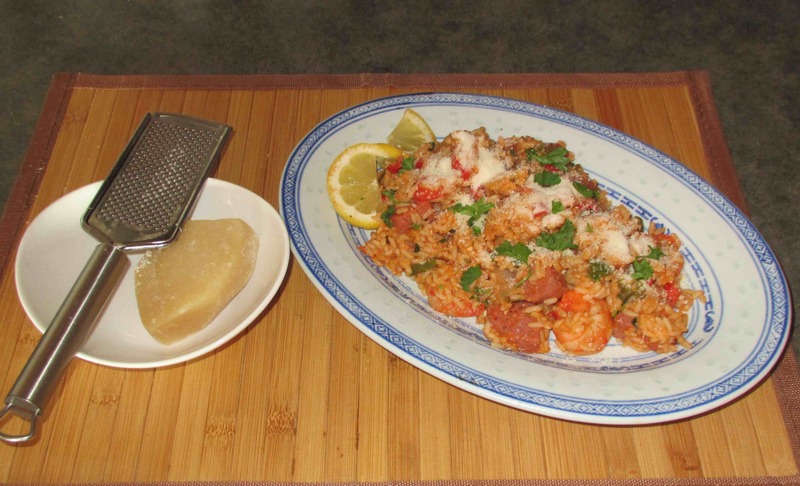 Risottos, Paella, Jambalaya and Biryanis are at the top of my favorite foods…. there’s a definite trend there! You’re missing celery! Celery, onion, and bell pepper are the holy trinity of Louisiana cooking. 😉 I usually start with the trinity and then throw my shrimp in at the end. 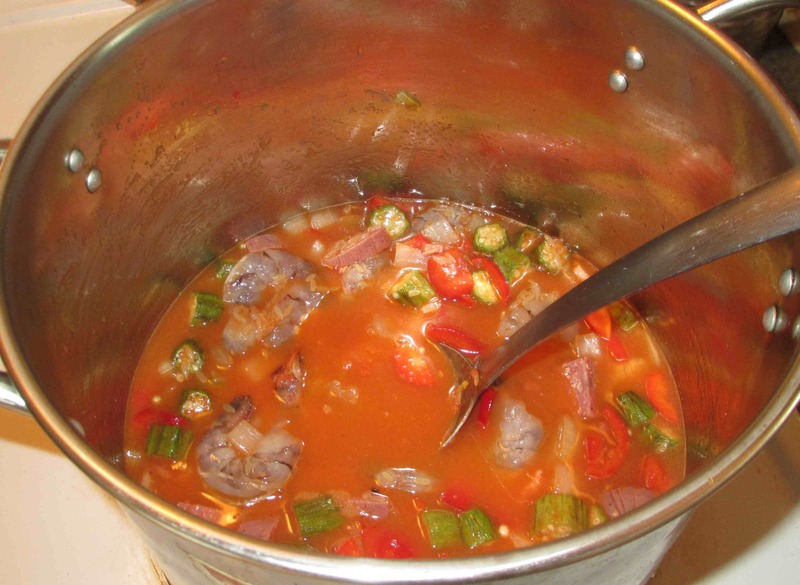 Okra is great in stews, because it will naturally thicken the sauce. Yum! 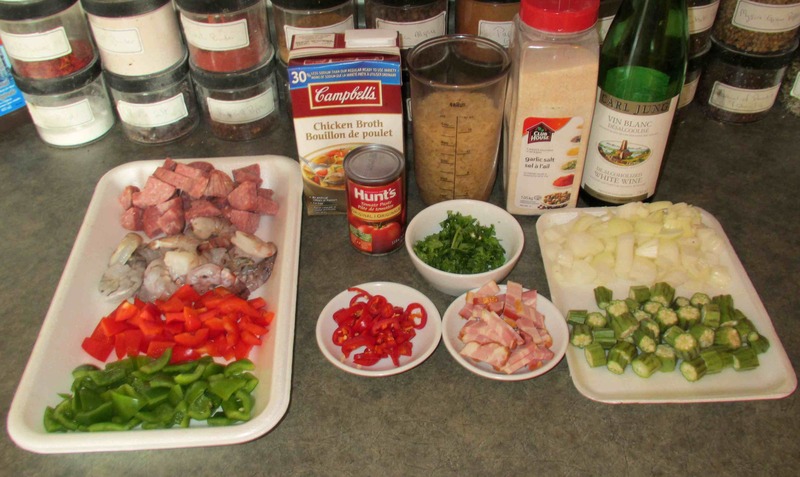 I think it’s high time I made some jambalaya soon. Thanks for the inspiration! Funny, I finished reading this and was thinking, “Dude, you forgot the celery!” too. My wife hates it as well, but I love it so I cut it up pretty chunky so she can pick it out. I sprinkle a little cayanne and Tony Chachere’s on the rim of the bowl too so I can spice up each bite. I know it isn’t supposed to be spicy per se, but I am a believer in the Emeril – BAM! I have never put the okra in mine, but I am going to next time. Looks fantastic! I love Tony’s! I went to university in New Orleans, which is where I learned to put Tony’s on everything, especially scrambled eggs! That’s an awful lot of ingredients in that photo! I bet the flavours really came together. I love Jambalaya and Paella, but I’ve never tried the others you mentioned. Must search out a recipe for it. Risottos and Biryanis are more of a class of dishes rather than each being a specific dish… both are rice based but have countless variations. Risotto is Italian and a dish I make often… Biryanis are Indian and my wife makes a pretty mean version…. Oh! I forgot to add that Okra isn’t something I usually put in this dish and is optional but it was a VERY nice addition! It wasn’t slimey at all and really added to the dish. I like most all the dishes that I associate with New Orleans. Your jambalaya sounds like I would really enjoy it. I sometimes put chicken in mine as well when I’m making this for guests. I would say I probably use chicken as often as not too!